Many of my students have a difficult time understanding some abstract math concepts. The best way to help them is to find activities involving real-life objects and opportunities, engaging students from the concrete to abstract. The concept of π is familiar to students, but they really don’t understand, what it means. I need to spend some time collecting materials. I try to find circular items like a magnifying glass, a clock, plastic cylindrical containers like soup cans, or oatmeal tins, measuring tapes, ropes or strong yarn and calculators. Students work in this activity as a pair-share. First students measure circular objects and collect their findings about the ratio of the circumference to the diameter. This part of the activity goes well and they like to shout that they already understand pi! The second part needs larger space than your regular classroom, because they have to draw a large circle. A playground outdoors or a spacious corridor will do. Take this activity outside and allowing them to use their own shoe as a measurement, they will be amazed! 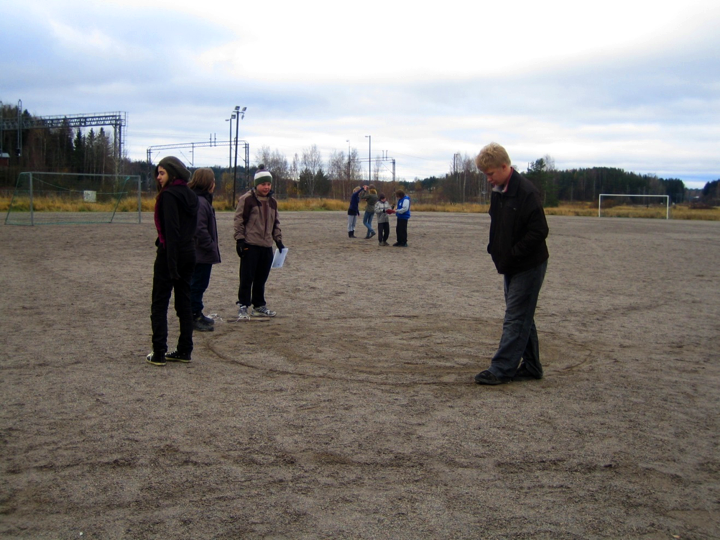 Drawing a circle in the dirt or on the snow with the help of rope and stick is not so obvious for them. 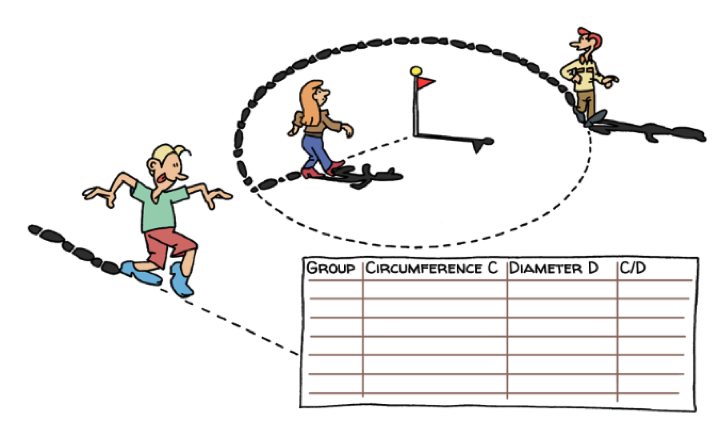 During measurements they often change the measurer, the other is measuring the circumference and the other diameter. Can you do this! You get fascinating conversation about it. This activity touches students deeply when they discover that even when using their own shoe as a measurement the ratio remains the same. In this method they have enacted the Greeks investigation on this idea and obtained the same values as they did. Most students even at the junior high school level have heard of π but only after doing this type of activity do they really understand the concept. Date 3.14.15 is a great opportunity to arrange this in the school yard! Make the Pi Day of the century. Find more fun mathematics exercises such as this on in Paths to Math. This you find from the module Geometry 2 , chapter 5 and 5.3 Going around in circles.